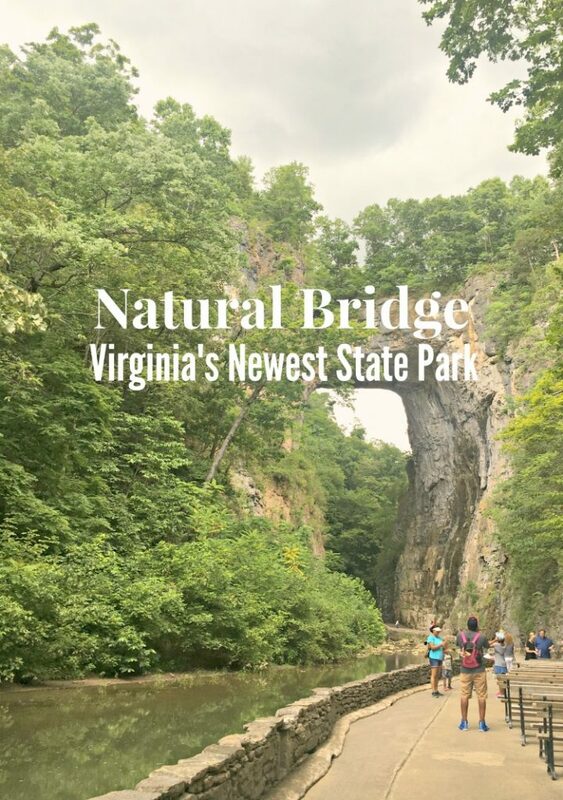 Big news: Virginia just opened its 37th State Park, Natural Bridge in Rockbridge County. This isn’t really a new park since Thomas Jefferson bought it from King George III way back in 1774. He opened it as a privately owned park, which it has been ever since (you know, 240 years or so). In 2013, the owner decided to sell it — and now, it’s a state park! I’m just a bit excited. Why? I’ve been to many beautiful places around the world — some manmade, like the Great Wall of China and the Eiffel Tower. Others are naturally beautiful, like the Smoky Mountains, cenotés in Mexico and the Pennsylvania Grand Canyon. But Natural Bridge? Does it stack up against the others? YES! To put it simply, Natural Bridge is awe-inspiring! After purchasing tickets, guests descend dozens of stairs to the trail that leads to the bridge. Don’t worry — if that’s too many stairs for you, you can take the tram. Once on the path, head right along the lush pathway. You’ll go around a bend as Natural Bridge appears in all its grandeur before you. Enjoy the view. Be patient, though, if there are other guests around. A good shot is worth the wait. While the bridge itself is the star of the show here, there’s more to do — adding value to your admission ticket. 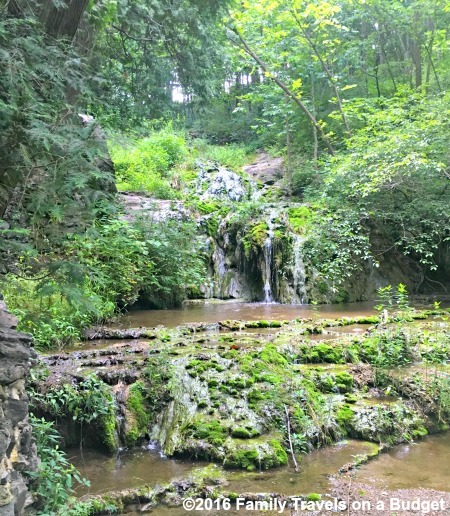 Once you get that photo, continue along the Cedar Creek Trail to the Monacan Indian Living History Exhibit and the waterfall. A rainstorm popped up on our visit so we didn’t make it to the waterfall. Some say it’s nothing special, but from what we saw, the trail alone makes it a worthy (and easy) walk. Along the way, you’ll also see an old saltpeter mine used during the War of 1812 and the Civili War to collect raw materials for gunpowder production and the Lost River, a mysterious underground channel of water that spills into Cedar Creek. 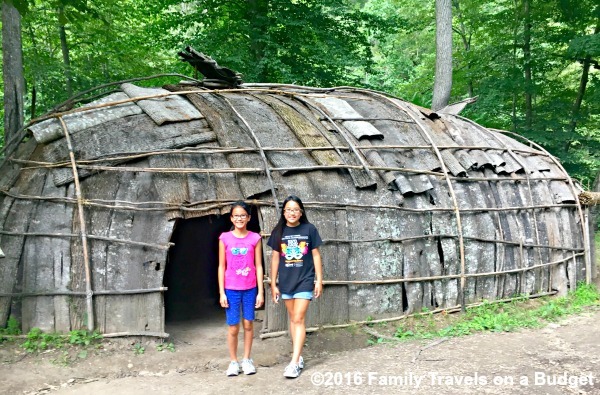 Along the trail to the waterfall, an exhibit highlighting life in the Monacan Indian nation offers a great place to discover history. Visitors learn about cooking, tool production, pottery, basket weaving, gardening and more. The life-size replica village inspires curiosity as kids explore. In fact, as the thunder began to rumble, I had to nudge the girls to head back to shelter. (We did not see the show — provided for information only) Most nights at dusk, Natural Bridge comes to life with a spectacular sound and light show called the Drama of Creation, which has been tradition for almost 100 years. This presentation, based on the story of creation in the Book of Genesis, was included with admission prices when Natural Bridge was a privately owned park. Now that it’s a state park, the Drama of Creation will continue — but it will be run by a private company and offer FREE admission after the park closes on select nights. We thoroughly enjoyed our visit, but there are some things I wish I had known before going. During the summer months, consider visiting in the morning — when temperatures are a little cooler and rain showers are less likely. 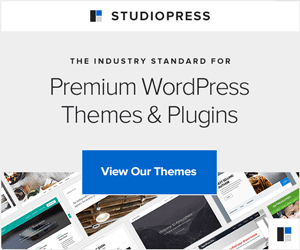 Wear sturdy shoes! There are lots of steps (I think we counted 211) down to the bridge and trail. If you don’t want to take the stairs, take the free tram. Pricing is $6 for kids (age 6‐12) and $8 for adults (age 13 & up). The park is also an “Affiliated Unit” of the National Park Service. Admission to the Drama of Creation is FREE — with hours beginning after the state park closes for the day to the general public. The park is open daily from 8 a.m. to dusk. Natural Bridge State Park will be adding programs and features in the coming years, so check the website before your visit to see what’s available. I am glad that Natural Bridge has become a state park. As a private park, admission prices were high — necessarily — to keep the place running. Through the state park system, park expenses are streamlined making visits affordable for more people. Also, the state park designation provides additional protection and preservation. 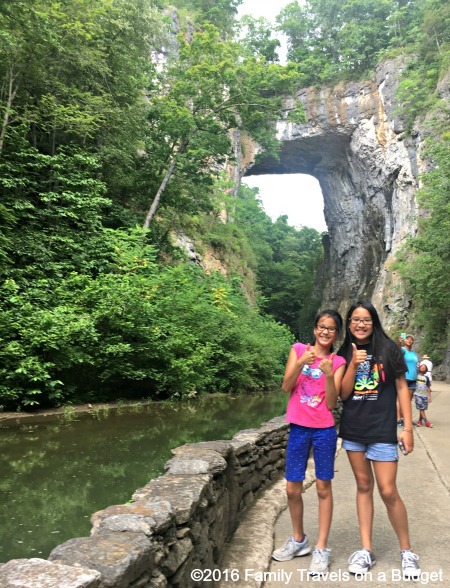 To plan your trip to Natural Bridge in Rockbridge County, visit the Lexington Visitors’ Bureau for information on lodging, dining and other activities in the area. Be sure to check their specials and packages link for great savings!